Origin: Northwestern Argentina and adjacent Bolivia into Brazil; widely cultivated in warm and tropical regions around the world. Jacaranda has been a significant and successful invader species in the northern and eastern parts of South Africa in savanna, riparian woodland and forests in sheltered situations. Also, invasive in southeastern Queensland, Australia, naturalized in Hawaii. 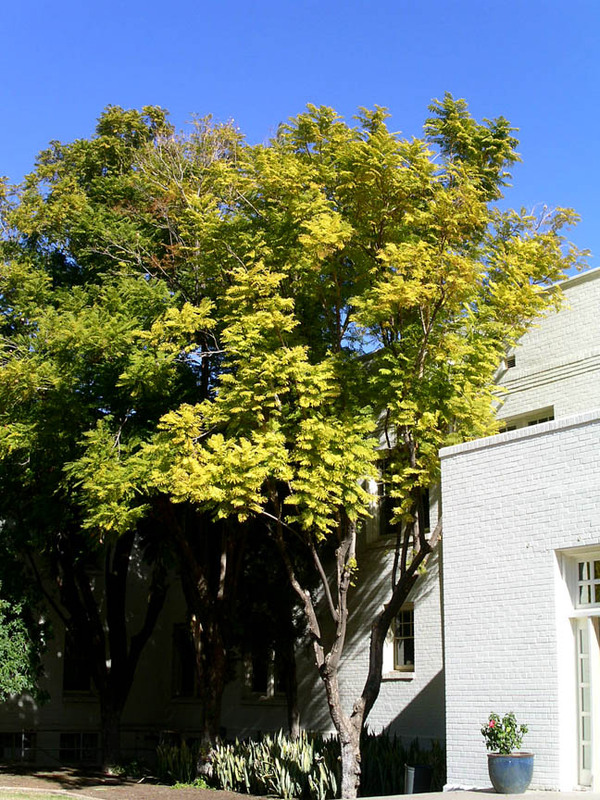 Landscape Use: Wonderful spring accent tree, shade tree, lawn tree, park tree, commercial landscapes, street tree in southern and central coastal California. Form & Character: Upright, open, irregular, sometimes round headed,regal, celestial. Growth Habit: In Phoenix, jacaranda is a briefly deciduous tree in winter/spring, moderate growth rate to 50 feet in height with a near equal spread. Foliage/texture: Large, bi-pinnately compound leaves to 20 inches long on coarse, green brittle stems, opposite arrangement, older stems with prominent lenticels; medium texture. Flowers & fruits: Clusters of wonderful, terminal, large showy, tubular, lilac-blue flowers; fruit is a hard, circular, dark brown pod, 2 inches in diameter ripening during the summer and fall. Seasonal color: Lilac blue in April/May in low deserts to June in California maritime climates, yellow foliage in winter. Temperature: Hardy to 27oF. Damaged during the coldest winters in Phoenix. Light: Full sun, though avoid reflected or western sunlight on the trunk as it is susceptible to sunscald. Soil: Tolerant, but well drained is preferred. Watering: Needs deep, regular supplemental watering, especially during the warm time of year. Pruning: Elevate canopy base, shape and stake trees when young to promote a standard form, otherwise jacaranda will have multiple trunks. Propagation: Seed and/or softwood cuttings. Disease and pests: Various root and stem rot pathogens seem to love to feast on jacaranda wood. Additional comments: Jacaranda is susceptible to high temperature trunkscald injury and low temperature freezing injury in Phoenix; because of this I do not advocate extensive use of this otherwise gorgeous landscape tree in Phoenix landscapes. 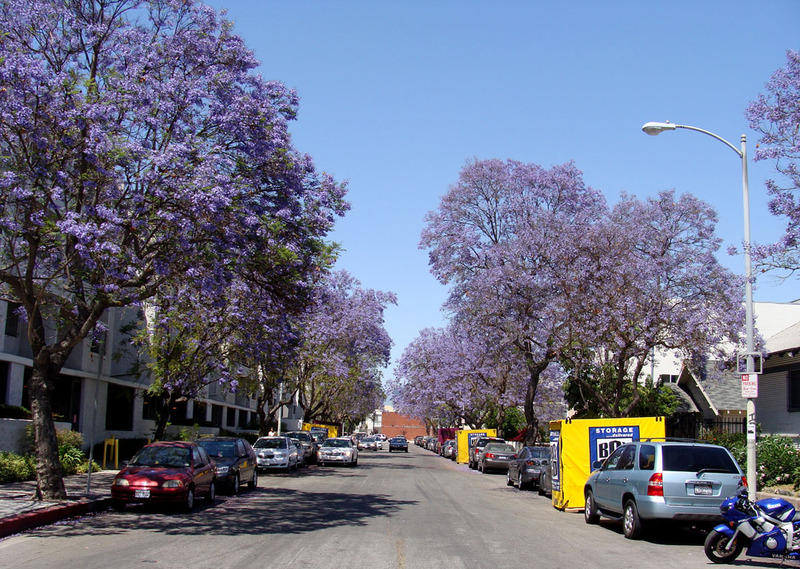 Jacaranda is the great skyline tree of Santa Barbara, California. In short, this is a `California' landscape tree brought to Phoenix where it is a marginal performer because of our supraoptimal summer temperatures and winter cold. Occasionally though, winter weather will cooperate and such was the case in the 1997-98, 2002-03, and 2004-05 winters when El Nino rains induced a spectacular spring floral display (since then not so much). Cultivar 'Alba' has white flowers. Jacaranda trees produce moderate amounts of litter debris. The Jacaranda cultivar 'Alba' produces brilliant white flowers.